How can humane models of fishing be developed? As discussed below, some artisanal fishers are already using humane methods of slaughter with relatively more humane capture methods, and some research is currently investigating the use of percussive and dry electrical stunning machines which could be used on trawl-caught and other fish. Fishers who are already bleeding the fish may be the most likely to begin to adopt humane slaughter methods since humane stunning would only involve adding another step in a current process. 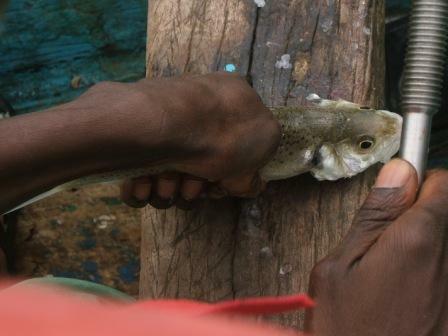 Humane slaughter methods may be easier for artisanal fishers since some are already employing them but, on the other hand, larger fishing operations will have economies of scale with the use of humane slaughter technology. Slaughter method : manual percussive stunning followed by bleeding. Alaskan’s OwnTM is a family-run company marketing fish harvested by fishermen participating their Fishery Conservation Network. This network promotes stewardship innovation among fishermen who are operating in Marine Stewardship Council certified fisheries and going beyond requirements to improve best fishing practices. The fishermen own and operate small, shore-based boats, most of which are under 60 feet in length. Usan Fisheries percussively despatching a salmon. Slaughter method : Manual percussive stunning possibly followed by bleeding. 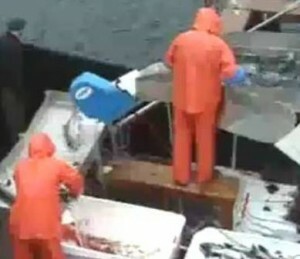 YouTube video viewable from the website homepage shows fish being percussively stunned at 4 mins 17 secs in. Credit: Wild Salmon Direct on YouTube. Slaughter method : manual flow-through percussive stunning machines followed by manual bleeding. Recent research into the humane slaughter of trawl-caught fish using electrical dry-stunning was discussed at the Humane Slaughter Association’s Centenary International Symposium (see our reports from the ufaw and hsa symposia portsmouth july 2011). Slaughter method : manual spiking followed by bleeding. One of the primary reasons for their pursuit of the organic label was to have a processing chain of custody that would allow them to make up their own set of standards/rules that each fisher would have to sign off to. Unfortunately organic certification was not continued due to the inherent difficulty of marketing food from wild fish as organic. 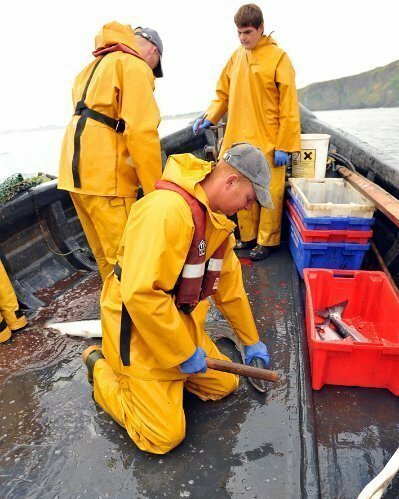 more sustainable jobs in fishing. Redesign of vessels may be required. Assurance will be more challenging on fishing vessels. Consumers often look to wild salmon as a higher welfare alternative to farmed salmon. A premium market in better welfare may help bring better practice across the whole industry.